This VIPRE Internet Security Review was written by me on behalf of Vipre. All opinions are 100% mine. My laptop’s internet security suite recently expired and I was offered to participate in a VIPRE Internet Security review, so I figured the timing couldn’t be any better. I hadn’t heard of VIPRE Interent Security before, but after taking a look around their site, it seemed to be a thorough program to help keep my browsers and PC safe. How did VIPRE Internet Security compare? Runs effeciently without bogging down the system when I need to get work done. You may be saying that you don’t really need an anti-virus program or security suite because all you do online is send a few emails and chat on Facebook, but these days really everyone that connects to the internet needs these programs. It is so easy to mistake emails that are really just phishing schemes (for example, someone may create an email that looks just like an email you’d normally get from your bank alerting you to a problem and sending you to a website that looks just like your bank’s – only it really wasn’t from your bank and the site really isn’t your bank’s – and if you submit your account info, they’re actually getting access to your account. Plus many apps and videos on sites like Facebook are actually malware and can infect your computer or take over your account. Sometimes websites even have malacious pop up ads that you weren’t expecting and really have no control over. So, now that we have it covered that you really do need internet security software, is VIPRE right for you? In a nut shell, I think it very well may be! Installing the software itself is very easy. 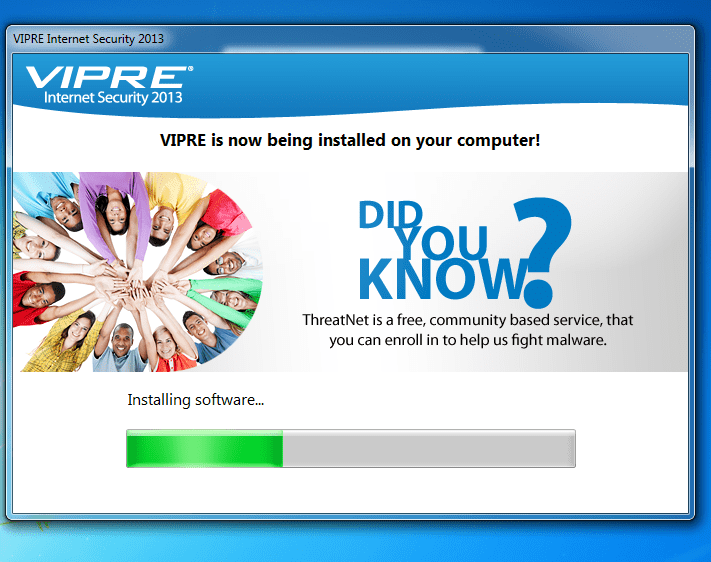 You simply go to the VIPRE Internet Security site and download the software then open the program to install. I love that you can get a 30-day free trial to try the software before buying! It takes just a few minutes to install with very minimal input needed. After installing, VIPRE is very easy to use. I love that they layout is very clean and has easy-to-read text and graphics versus many other internet security software programs that are fully text based. An in-depth scan only took about an hour and I was able to easily setup a daily scan early in the morning when I’m not normally using my laptop so that it doesn’t slow down my computer at all to interfere with me working. With my old internet security software it took me several minutes to find this option buried under several menus. I also love that very little maintenance is required as the software automatically installs updates and has a firewall to alert me to anything suspicious. Final Takeaway: I’ve been using VIPRE Internet Security for almost a week now and so far have nothing bad to say. It does the intended job while allowing me to do my job in a secure environment without interruption – love it! I hope you enjoyed this VIPRE Internet Security Review – be sure to check out our others reviews! computer security is soo important! !